We've been fans of GoPro cameras for years. In fact, we made our very first video with a camera GoPro sent us back in 2008. Admittedly, our video is a bit shaky and the picture quality leaves a bit to be desired. However, that was our fault, not GoPro's. If you want to see just how good videos can be with today's GoPro Hero 3 camera just watch the video below of Joerg Bergmeister taking practice laps at the 2012 Petit Le Mans in the Flying Lizard's Porsche 911 RSR. Sit back, turn up the volume and enjoy. Yeah, yeah, they had at least six different cameras running, but you only need one (two at most) to capture incredible videos of your own Porsche on the track or road (there $299 each ). We have no affiliation with GoPro, we just thought the video above was amazing! The undercarriage placement of one camera is just incredible. Did you see that tire expand and contract over the bumps? If you had trouble viewing the video you can watch it directly on our site at Inside the Flying Lizard 911 RSR at Petit Le Mans. 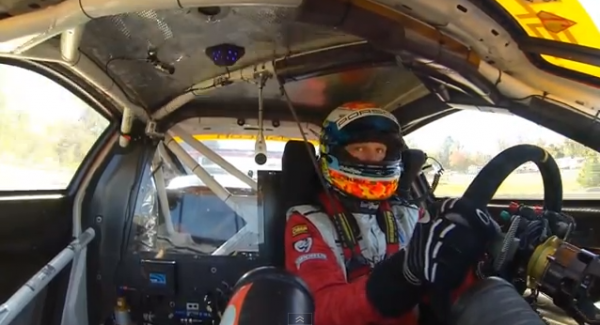 What Would Your Face Look Like as a Passenger During a Hot Lap in a Porsche GT3?